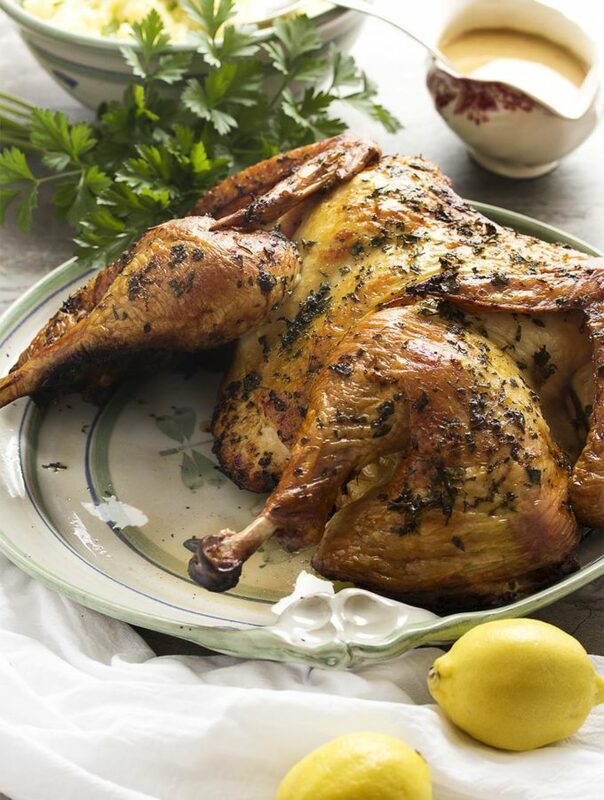 Looking for a great Saturday night dinner? 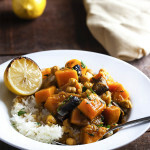 How about one which is quick to make (though there is some marinating time! ), but tastes like you spent all day? 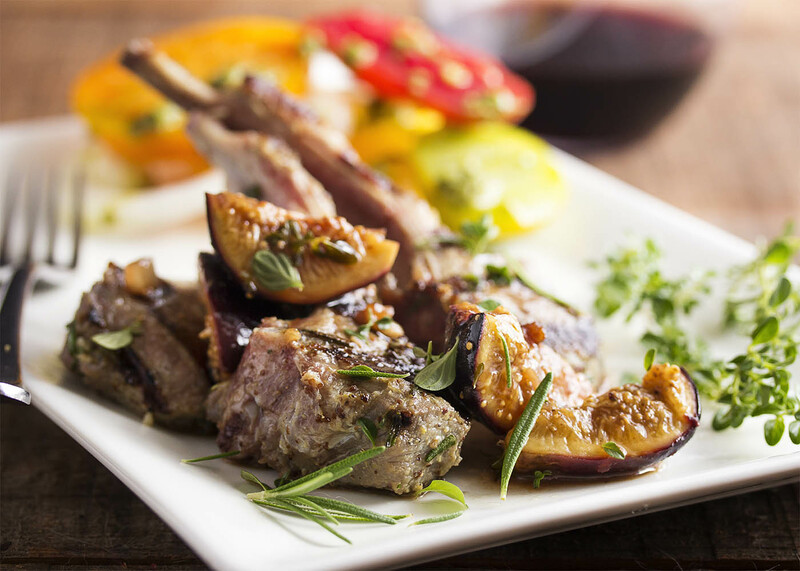 All you need is a few minutes on a hot grill to cook up the lamb chops and a few more to make a luscious fresh fig, port, and balsamic pan sauce. I had all these figs in the house after I made my Fig with Brie and Honey Appetizer dish. These figs needed to be used and FAST (since fresh figs don’t last all that long), so I only had a moment to decide how to use them. Thankfully, all I needed was a moment! 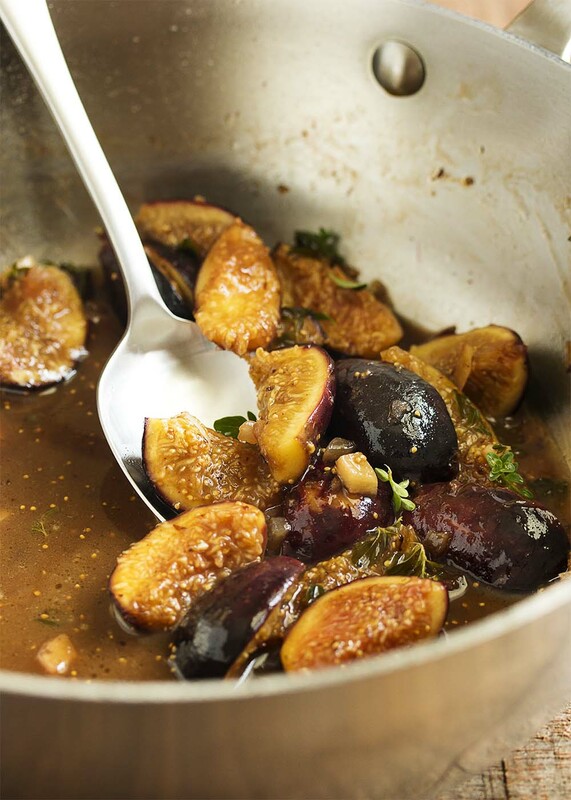 One of my favorite ways to enjoy figs, dried or fresh, is in a pan sauce alongside some seared lamb or pork. Either meat has a flavor profile I find matches well with figs. And, since I’m already working on a great weeknight meal with pork tenderloin, I went with a fancy Saturday night meal with lamb. 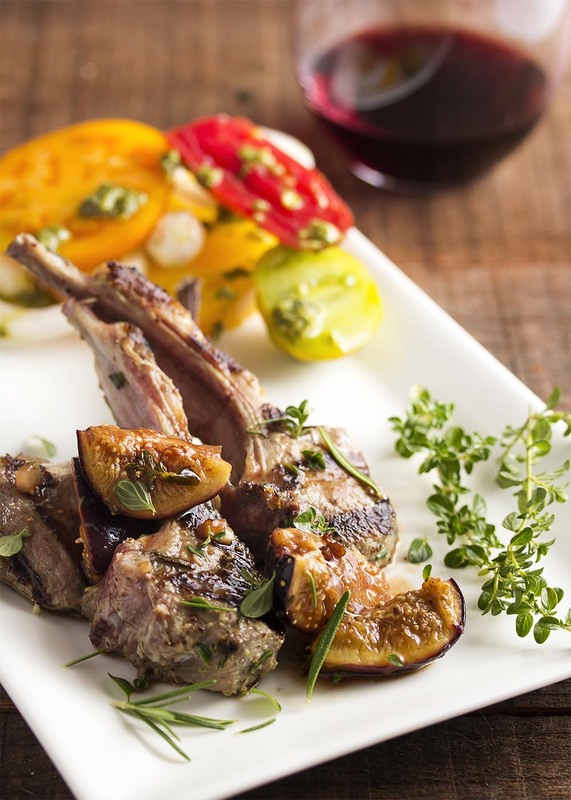 For a fancy Saturday night meal, my go-to cut of lamb is lamb rib chops. 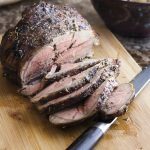 Butterflied leg of lamb is great for a crowd and lamb stewing meat is wonderful for a homey family dinner, but you can’t go wrong with rib chops, or a complete rack of lamb, when you want to impress or romance. Add fresh figs to the mix and your dinner goes from impressive to WOW. Fresh figs are very different from dried. 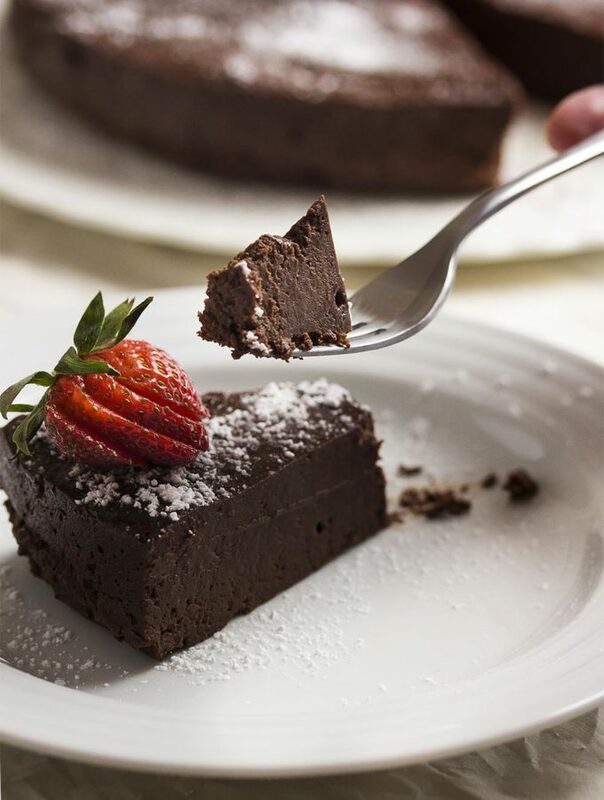 They are soft, a little chewy on the outside, and tender and sweet within with crunchy seeds. All of this adds up to a fruit which is worth searching out. 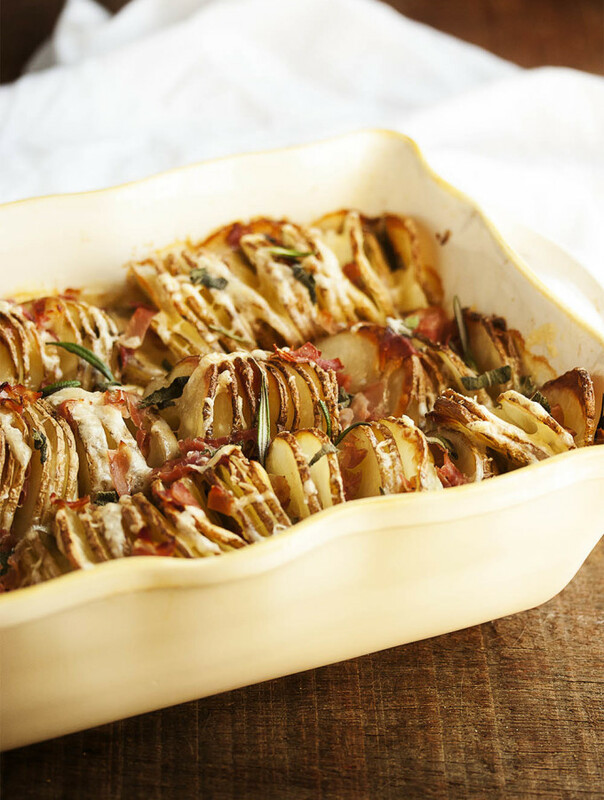 The figs in this dish are added at the very end of cooking. Just to warm them through and let their flavor add to the sauce. Don’t add them too soon or they will turn into mush! Tasty mush, but not what we are going for here. 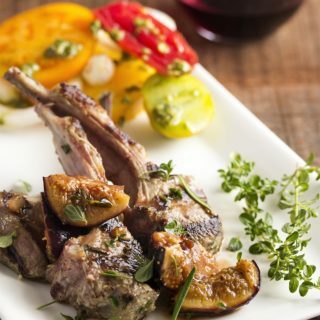 🙂 We want distinct fig quarters, just warmed and sauced, which you can let burst in your mouth along with the rich and tender flavor of the lamb. Tip: You can start the fig port sauce ahead of time. Just bring it to the point just before you add the figs. 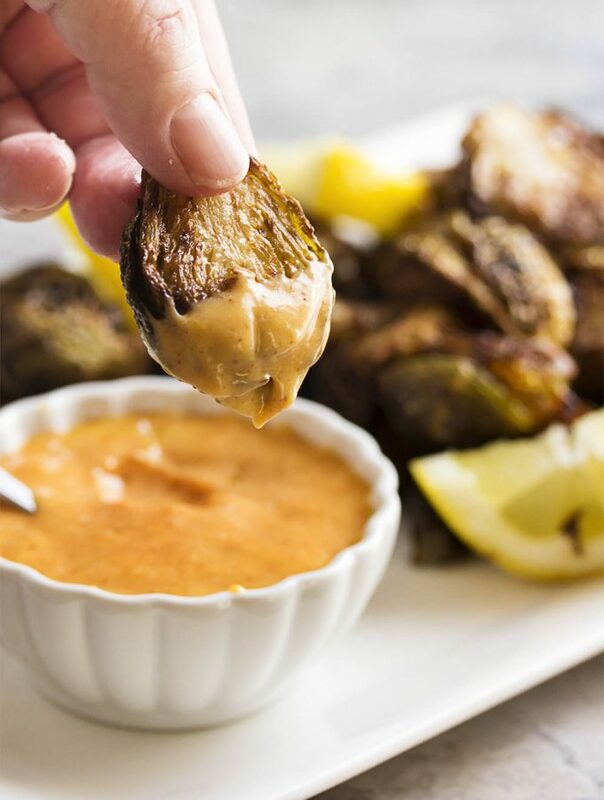 Cool the sauce and store until it’s time to eat then warm it back up, add the figs, and enjoy! 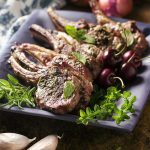 As for the lamb, tiny rib chops are wonderful as is, but an overnight soak in a herb and mustard marinade makes them even better! Making the marinade is the work of moments. A little chopping. A little stirring. Put everything in a sealable bag or container. And into the fridge it goes. It does take a little advance planning, but if you can even give a few hours that will give the meat some flavor. Remember to trim the lamb! 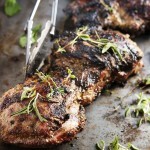 Whether you buy the rib chops already cut or buy them in a rack, you will need to trim the connective tissue and fat off the chops. Yes, this will trim off some of that precious meat too. But I have a plan for it, so it won’t be wasted! You are going to save up the scraps and then saute them in your skillet to make the base of the pan sauce. 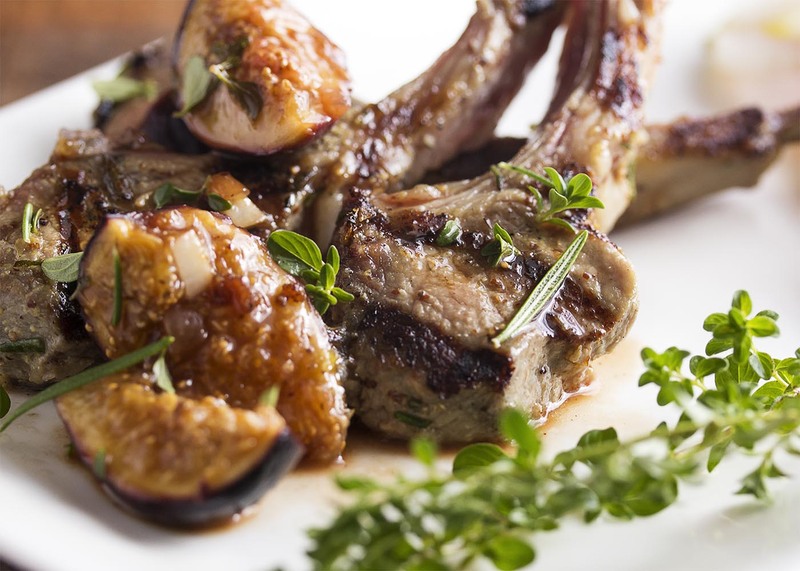 Lamb rib chops are grilled and served with a sauce of fresh figs, port, and balsamic in this quick and elegant main course. Trim the lamb of all connective tissue and excess fat. Reserve the trimmings for the pan sauce the next day. Mix together all of the marinade ingredients. Pour the marinade into a resealable bag or container. Add the lamb and give it a toss to coat it in the marinade. Put it in the refrigerator overnight. 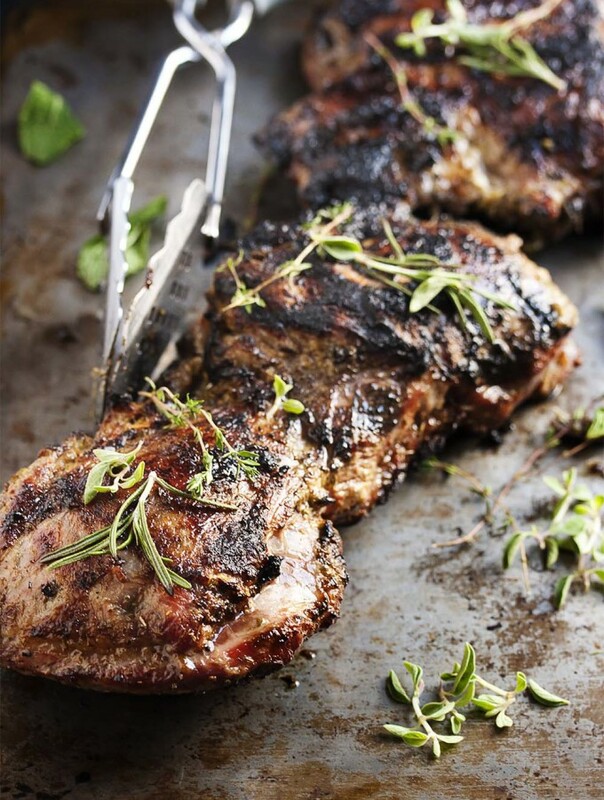 Take the lamb out of the refrigerator ½ hour - 1 hour before you are going to grill. While the grill is heating, begin making the pan sauce. In a medium skillet on medium high heat, saute the lamb trimmings until they are fully cooked and crispy. 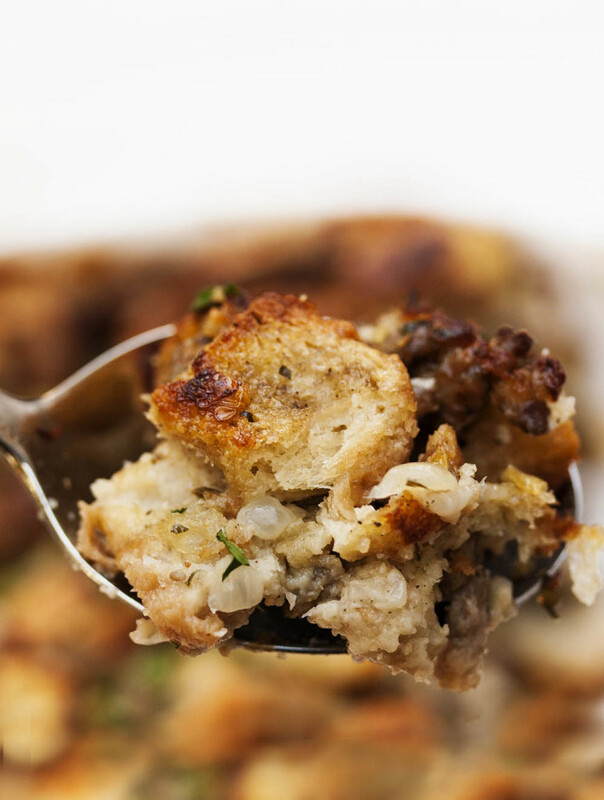 Scoop them out of the skillet, leaving the fat and the bits of meat stuck to the pan behind. Add the salt, shallots and garlic and saute for 30 seconds. Add the port and bring to a boil. Let the port reduce for 5 minutes, then add the chicken broth and balsamic vinegar. Bring to a boil again and reduce for 5 minutes. Take the sauce off the heat while you grill the lamb. Take the lamb out of the marinade and wipe it off. 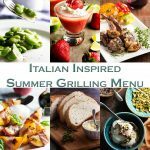 You don't want all that olive oil on the grill. Grill the lamb on high for 3-4 minutes per side. Medium rare lamb is 125F, and medium is 135F. Use your meat thermometer to check for doneness. Set the lamb aside to rest for a few minutes while you finish up the sauce. On medium heat, bring the sauce back up to a low simmer. Add the figs. 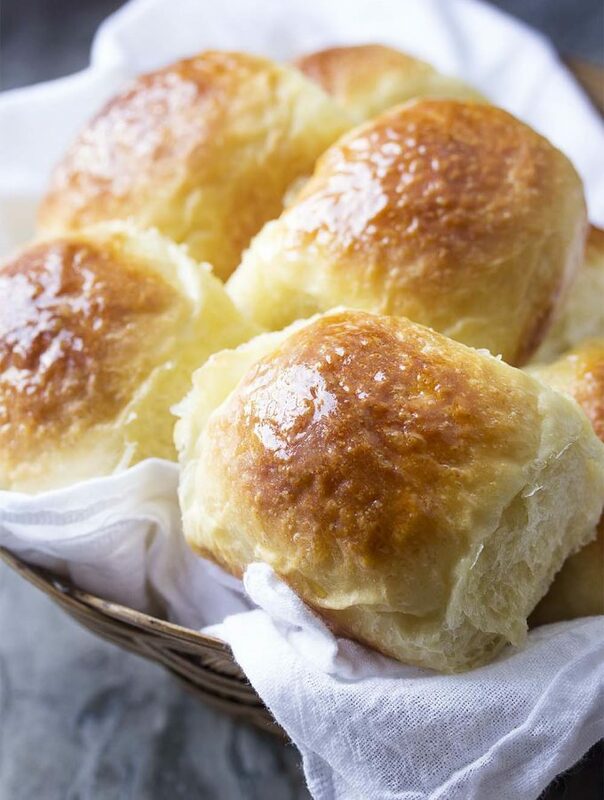 Warm them through, 1-2 minutes. Take the sauce off the heat and add the thyme. Wait about 30 seconds, then start stirring in the butter. 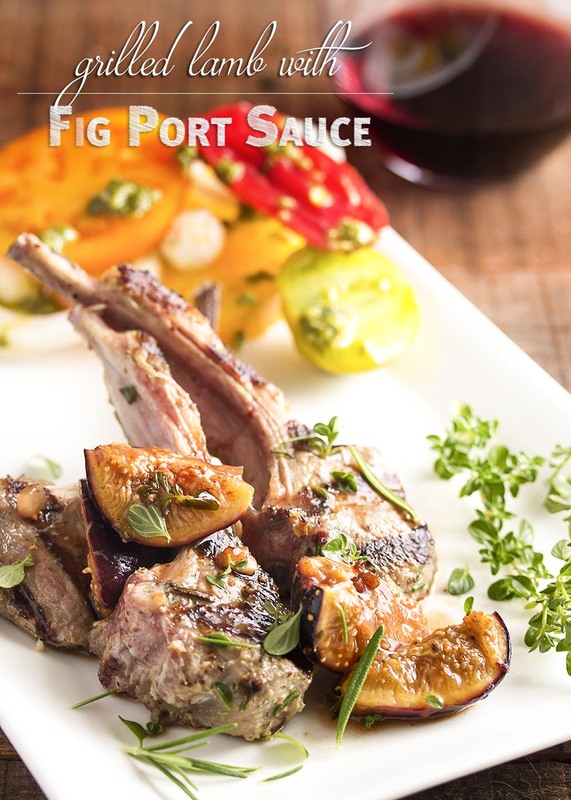 Once the butter has melted and the sauce is glossy, serve the fig port sauce with the lamb. If the sauce is too hot when you add the butter, it will break. 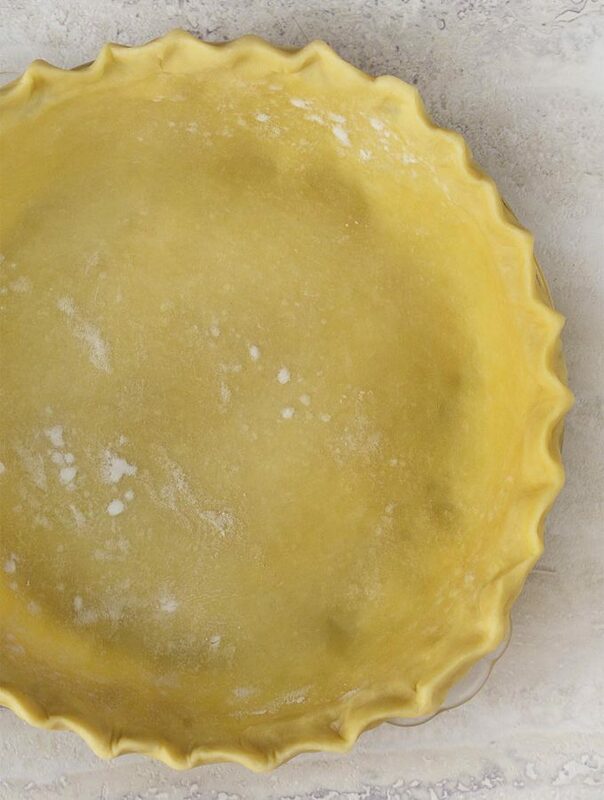 If you're not sure, wait a few extra seconds before adding the butter. If you start with a rack of lamb, you can cut the rib chops by two, so you have two bones in each chop and four chops total. To grill these thicker chops, start on high and give the lamb a good sear on each side, about 2 minutes per side. Then reduce the heat to low, cover, and let it finish cooking through. Check with your thermometer and take it off when you are at your desired temperature. Gosh that fig port sauce sounds incredible! I’ve not cooked with fresh figs very often but they are gorgeous. Thank you! Fresh figs are pretty amazing. Nice idea, saving the trimmings for the wine/fig sauce. 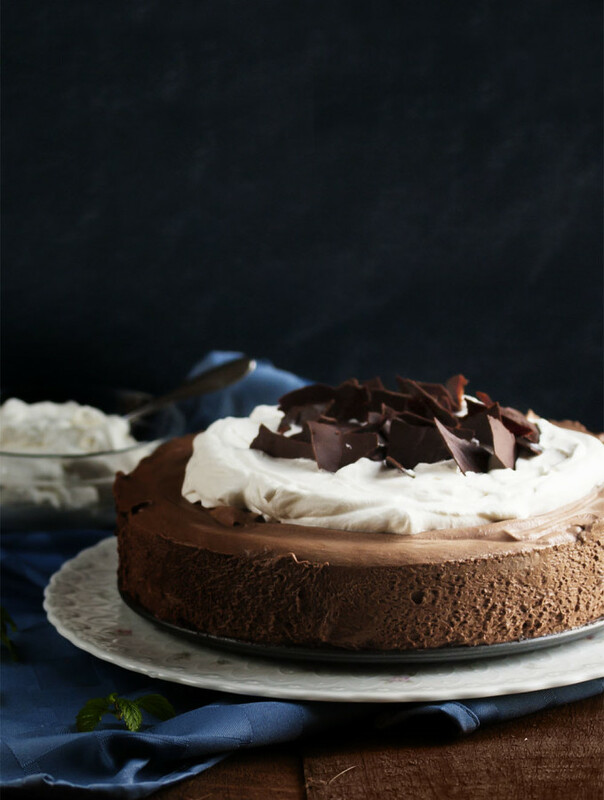 Great recipe & beautiful pictures. Well done (your post, not my lamb)! This is basically my dream dinner. Medium rare lamb + figs. 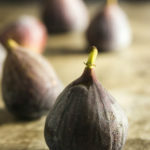 Now if only I could find fresh figs – I will never forgive our friends with the fig tree for moving away! Too bad about your friend. 🙁 I wish fresh figs were more available! I know they are perishable but a lot of markets don’t even carry them. Oh!! I’ve been wanting to try making a port sauce.. and I have figs! Yay! Well, there you go! It’s fate. I love figs, but I always tend to eat them raw. Never tried cooking with them though! 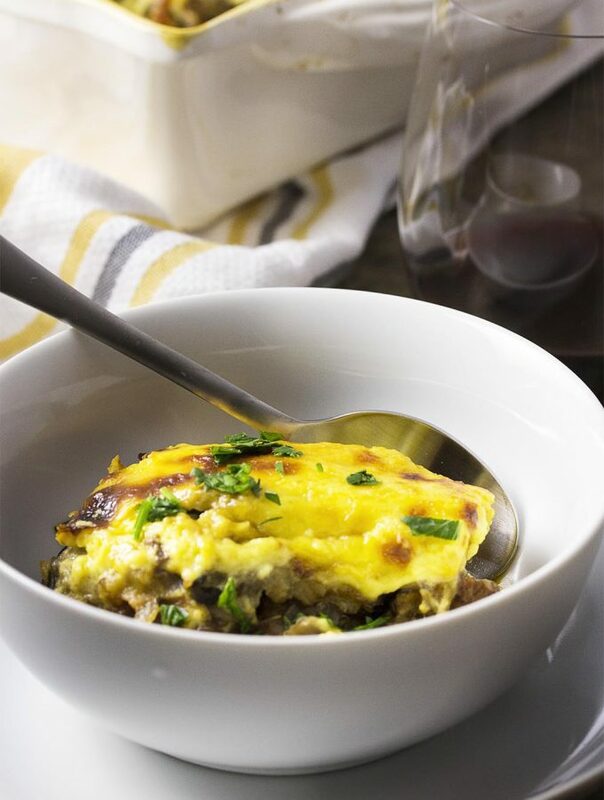 what a genius way to use up those fresh figs and they pair so beautifully with lamb and port. 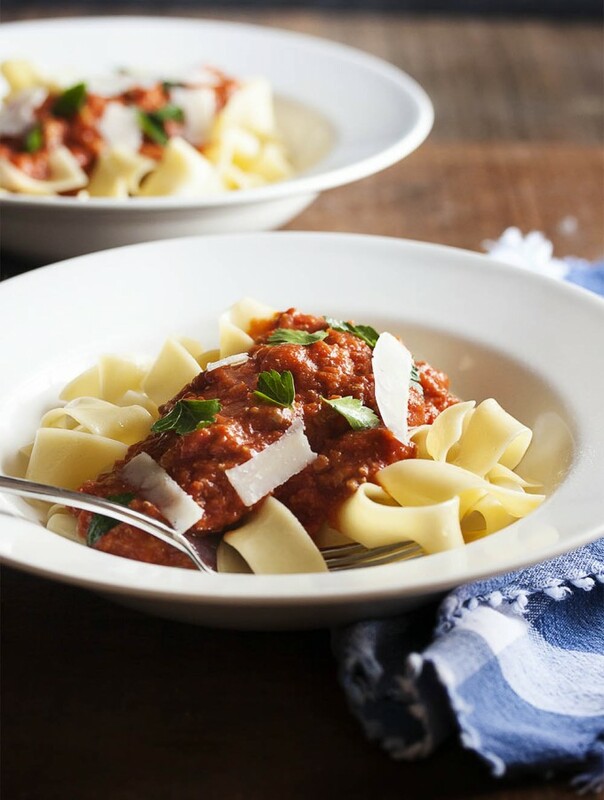 no need to head out to a restaurant on saturday night with this dish. 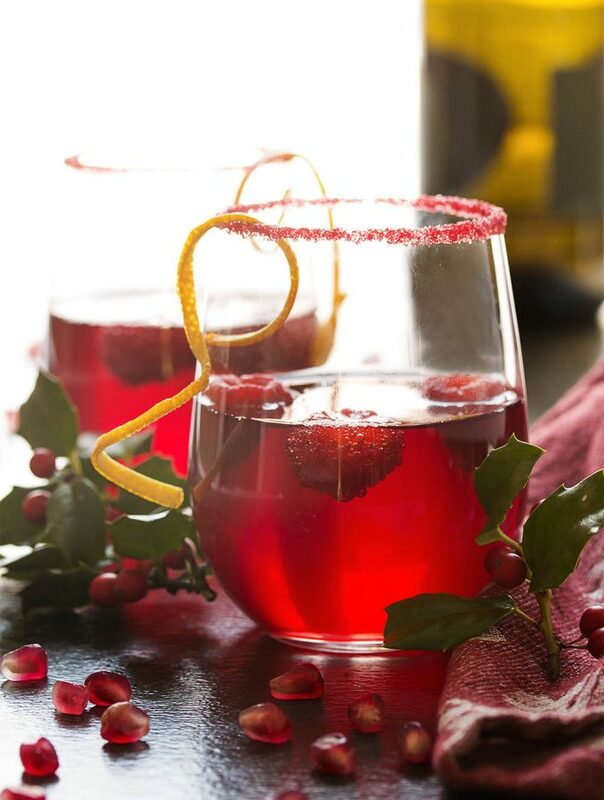 time to light the candles, open a bottle of wine and have date night at home!